Delight in the energy and exuberance of Jeff Civillico's comedy act at the Paris Las Vegas on the Las Vegas Strip. During his family-friendly afternoon show, Civillico juggles everything from bowling balls to chainsaws and balances a ladder on his chin while riding a unicycle. Playing five days a week, this high-spirited show also features physical comedy and plenty of audience interaction. Choose from general or VIP seating for this fast-paced performance that's an ideal break from the afternoon heat! 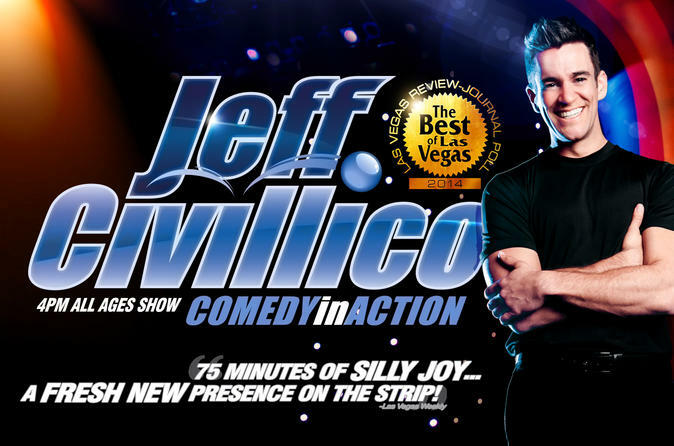 Head to the showroom at Bugsy's Cabaret at the Paris Las Vegas, located on the Las Vegas Strip, for your afternoon performance of Jeff Civillico: Comedy in Action. One of the youngest headliners on the Strip, Civillico's blend of wit, improvisation and physical comedy is inspired by legends such as Steve Martin and Jim Carrey. His over-the-top antics, friendly persona and sharp wit have won him gigs at Disney resorts and on the Travel Channel; he's even performed at the White House! Civillico combines lively comedy with daring stunts such as balancing a ladder on his chin while riding a very tall unicycle. At the heart of his show are his jaw-dropping juggling acts. He juggles bowling balls, knives, chainsaws and fire in the course of his 75-minute performance and invites kids and adults up on stage to be part of his incredible tricks. Choose from general or VIP seating for your show and prepare yourself for lots of laughs and plenty of 'oohs' and 'aahs'! Choose to upgrade your experience with VIP seating for a better look at the action during this 75-minute show.